Manso highlighted that the ETP's main objective is to train a qualified labor force and to guarantee work to students immediately after graduating. He said the ministry is working on a study plan that includes reducing curriculum to only the relevant subjects in each specialty. The de-emphasis of non-technical disciplines (McCrory even made fun of languages) has long been a hallmark of Cuban education. One problem the Cuban government has with social sciences and humanities is that they create people who challenge conventional wisdom and authority. This Michael Gerson op-ed on immigration may well be a sign of things to come. It blames Barack Obama for being inflexible on immigration. Even more bizarrely, he claims that Democrats are "beholden to Latino voters." Huh? Causality works the other direction. In recent years Latino voters have gone to the Democratic Party in droves because of the Republican Party's sharply nativist tones. Over and over, Obama has said he wants to pursue immigration reform. Being "beholden" in this case simply means fulfilling promises you made about policy. But I would expect to hear more of this. Opposing immigration reform can be framed as standing independent: unbeholden if you will. Reform can then be seen as political catering rather than doing what you believe in or doing what's right. To be fair, Gerson doesn't make that argument. Strangely enough, he actually says that Republicans should try to get beholden too. Ezra Klein notes Barack Obama's political dilemma on immigration. Leaning too far in either direction carries risks. If the White House hangs too far back from the process, the bill could evolve in a direction they don’t like. Details of the Senate compromise are already causing some heartburn among immigration reformers, not to mention among White House policy experts. If it gets further watered-down in the House, it could become unacceptable, and the White House will be faced with the unpalatable choice of vetoing the only immigration-reform proposal that can pass or signing a bill they don’t like. But stepping too far into the process carries its own problems. Republicans are wavering on whether to support immigration reform, but they’re firmly decided on whether they support Obama. If immigration reform becomes associated with Obama, it could mean Republicans abandon it. As hard as it is for Sen. Marco Rubio (R-FL) to make the case for a path to citizenship to Rush Limbaugh, it’s even harder for him to make a case for Obama’s path to citizenship for Rush Limbaugh. So maybe look for immigration reform to get a label intended to personalize it to Obama and thereby make it less palatable to conservatives. Obamagration, anyone? The big immigration proposal outline is here. It's a big deal to have this much out there with key senators on both sides. It contains what you would reasonable expect--flexible acceptance of needed workers, enforcement and verification, path to citizenship for those in the country illegally, acknowledgment of people who came here as minors, etc. One sticky point I see is the idea that a commission of border elected officials will rule about when border security measures are "completed." This is fine as long as you view only whether the measures are in place, rather than waiting for some impossibly perfect achievement of security. The latter has been the hammer with which opponents of reforms have hit proposals, claiming that reform cannot proceed until the border is sealed. Since it will never be sealed, then reform is postponed indefinitely. There will be plenty of sticky points. I recommend this interview of Nicolás Maduro by Eva Golinger. It's pure messianic politics. Everybody knows how President Chavez has invested all his efforts and energy into his country, into fighting for the independence of Latin America, how he has persevered in his anti-imperialist struggle for social justice worldwide. It was President Chavez who went vocal about global warming, so that everyone could find out the truth. It was he who championed the struggle against global plunder and the neoliberal policies that are killing Europe. The next four chapters cover the period from August 1945 to December 1960. They deal with the feats the President performed by successfully implementing the historic tasks for carrying out social revolution at two stages, waging the Fatherland Liberation War, conducting the postwar rehabilitation and construction and laying foundations of socialism, and establishing the Korean-style socialist system centered on the popular masses in the DPRK. The last four chapters cover the period from January 1961 to July 1994. They deal with the immortal feats the President performed by successfully leading socialist construction of various phases and thereby building a socialist power, independent in politics, self-supporting in the economy and self-reliant in national defence and fully demonstrating its dignity and might. It's pretty gaggy stuff, and does not provide much confidence that he's telling the truth. Here is an American Enterprise Institute blog post about Jeb Bush's stance on immigration (it seems he is publishing a book on the topic). The AEI is a good place to get the economic conservative (meaning pro) take on immigration. But there is something funny that I know will never be mentioned in the immigration debate yet is really critical. The argument is that "being American" needs to be more central for citizenship, and that means understanding the foundation of the country, how our institutions were created and how they work now, along with key speeches, I guess beyond the current test. Yet this would not mean these new citizens would be like other Americans, it would mean they are more American, because most native-born Americans do not understand these things. As a test, please go now and ask the closest person who is chosen to be an elector. If they think you mean dementor, then just go ask someone else. So many op-eds about how the Obama administration needs to do more in Latin America. Here's another in the Financial Times. The main problem is that the suggestions given in all of these articles are actually minimal. In this case, the key policy prescription is to take the FTAs we have, gather them together into a mini FTAA, and then say Brazil can join if it wants. OK, great. The fact is that despite all the hype, the U.S. trades a lot with Latin America, interacts a lot on a number of issues, but now is increasingly one player among many. And that's good. I've written about this before, but I keep wondering how much "doing more" reflects a nostalgia for a more hegemonic era. It was our self-proclaimed job to set the political agenda, dictate economic terms to the degree we could, and identify enemies. With more players, that is now much harder to do. And that's good. I am trying to keep an open mind. I really am. But this sort of article, touted by the Venezuelan embassy on Twitter, is tough to swallow (no pun intended). You see, there are food shortages in Venezuela, but that's only because people are eating better. (And this is a switch from denying there are any shortages, or saying shortages exist but blaming the opposition). Mentioning health improvement is a non sequitur. A healthier population is wonderful, but it strains credulity to suggest Venezuela is eating itself into scarcity. What about the supply side? Our journey is not complete until we find a better way to welcome the striving, hopeful immigrants who still see America as a land of opportunity -- until bright young students and engineers are enlisted in our workforce rather than expelled from our country. That's not much, but especially in short remarks it matters. With immigration reform there's not much more to say. It's all about Republican electoral incentives. George Saunders' The Brief and Frightening Reign of Phil is a really strange and very funny political satire. There are two countries, Outer Horner, and Inner Horner, inhabited by creatures so strange you can barely picture them but with very ordinary names like Phil, Larry, Cal and the like. Inner Horner is so small that only of its citizens can be in there at one time, which then prompts a power hungry Outer Hornerite named Phil to create a crisis for his own violent political benefit. Nationalist abuses abound, with natural resources becoming the source of conflict. For example, Outer Hornerites have a national drinking song, "Large, Large, Large, Beloved Land (If Not the Best, Why So Very Dominant?)" Phil creates border problems and then blames the Inner Hornerites for being lazy, dirty, and aggressive. Meanwhile, the media hovers around him, shouting out headlines intended to reflect well on whoever is in power, then dump on those out of power. The political messages are blunt but still entertaining. Apparently he wrote it on a dare. “Piñera is not perceived as an honest or approachable president,” in contrast to his predecessor, the socialist Michelle Bachelet, who governed from 2006 to 2010 with an approval rate of over 50 percent. I am uncomfortable with analyses focusing on personal traits, but this is a really unusual situation. Piñera is not terribly different from Bachelet, yet her numbers ended very high after a trough, and his have remained stagnant. If we blame inequality, then we would expect Bachelet to have suffered as well. They are both establishment and moderate, fighting off the extreme wings of their coalition. The core direction of the economy has not changed. This leaves us with largely ad hoc reasoning about the differing outcomes. We also need to explain why Bachelet was so low in the first part of her term. Personal traits had not changed, nor had inequality or discontent with the economic system. Silvia Borzutzky and I have an article in Journal of Politics in Latin America: "Michelle Bachelet's Government: The Paradoxes of a Chilean President." It follows up on our edited volume and examines the contradiction of seeking to pursue inclusive policies while maintaining elite political consensus. She is the odds-on favorite to be the next president of Chile, without saying anything about it. Indeed, her failure to say anything says a lot. I think there is a lot of interesting research to be done on presidents who return to office after skipping at least one term. And who could resist doing work that would include mention of Grover Cleveland? “President Chavez has given us precise orders, he gave them also to the new foreign minister, our dear comrade Elias Jaua, that we are always disposed to have the best relations with the United States government on the basis of mutual respect and in conditions of relations of equality,” Maduro told Efe. This sounds very familiar because Raul Castro has used this type of statement almost verbatim many times in the past. In other words, Maduro came back from Cuba to tell the Venezuelan people that the Venezuelan president just wants to do what the Cuban president does. Both Diosdado Cabello and Nicolas Maduro insist that the latter is not taking any authority himself. Instead, Maduro is simply acting on the orders of the president. So now we have to consider what constitutes "instructions." Indeed, what does it mean to be in charge? As yet, there is no evidence that Hugo Chavez is conscious. His brother said he was conscious and communicating, yet for some strange reason he does not communicate with the Venezuelan people, and does not sign documents either. What a strange political limbo. The government goes on as if Chavez were just on vacation, railing on the opposition for even suggesting this is out of the ordinary. But if Chavez is not conscious, who is in charge? He is referring to travel restrictions. Part of the embargo's logic is that we can punish the Castros indirectly by hurting Cubans. Yet Cuban Americans' desire to help their own family members immediately makes that problematic. So we have a push to allow people to come to the U.S., with a contradictory push to isolate Cuba economically. I keep waiting for a reasonable argument to keep the embargo in place, but there are just crickets. I am an absolute sucker for good baseball stories. Kevin Guilfoile's A Drive into the Gap is a great one. It's a short non-fiction piece that connects a mystery about which bat Roberto Clemente used for his 3,000th (and last) hit and Guilfoile's father, who worked for the Pirates but now has Alzheimer's. There is some beautiful writing about baseball mingled with the difficulty of watching a father in decline. A father who no longer always recognizes his son, and even sometimes thinks he is a baseball player. If you like baseball, it's hard to imagine you wouldn't like this. I think we'll see more articles like this that ponder the leadership of the Latin American left once Hugo Chávez is gone. There's just one problem--Chávez doesn't really lead very much. He doesn't act as a model for Dilma Rousseff, or Michelle Bachelet. When Antanas Mockus made his presidential run, he went out of his way to say he didn't see Chávez as a model. As far as I can tell, he is largely irrelevant in Mexico, where Comandante Marcos is not a big fan. Chávez is very influential in some countries, but referring to him as "the" leader of a diverse left is inaccurate and misleading. Don't even get me started on whether a "Latin American left" exists. Given the speculation about Venezuela, this is remarkable. Read this National Intelligence Estimate of Cuban politics, dated June 14, 1960. 2. Fidel Castro will almost certainly remain in power through 1960, unless he becomes incapacitated to such an extent as to be unable to exercise personal leadership. The opposition to his regime, though growing, is weak and divided and lacks a dynamic leader. Should Fidel Castro depart the scene, a crisis probably would develop in a short time. Raúl Castro and “Che” Guevara would probably seek to carry on, but disaffected elements would almost certainly make a bid for power and there is a better than even chance that the country would be thrown into a period of widespread disorders and bloodshed. Sound familiar? It is a very useful reminder that all the guesswork is exactly that. And it goes right back to my discussion of "charisma." This piece in the Huffington Post is a really good example of why the Venezuelan opposition will find it hard to impossible to win a snap presidential election if Hugo Chávez dies. The essential argument mirrors U.S. views of Cuba, especially in the 1960s. Back then, U.S. analysts believed that support for the revolution was shallow and that once Fidel Castro was defeated/killed a moderate opposition could establish a popular government that was neither Batista nor Castro (which was really the foundation of the Bay of Pigs invasion). To that add hagiography of Henrique Capriles. His formidable discipline, determination and preparedness serve as critical unifying factors. Should snap presidential elections be called, Capriles can effectively seize the initiative and build upon the momentum of his recent campaigns. If "preparedness" is the best you can offer, you're in trouble. How about actual policy ideas? The article goes on to explain how all the gubernatorial defeats last year don't matter. Plus, all you need to do is "de-Chavezation" and go back to...whatever. Fortunately for the opposition, not even Capriles makes arguments that stupid. But there will be no presidential victory until the opposition convinces Venezuelans that it does not want to destroy institutions they like. If the electoral system is polarized between left and right, left will win. I had an interesting Twitter discussion with J.F. String (@jf_string) and Roque Planas (@RoqPlanas) with others joining in. 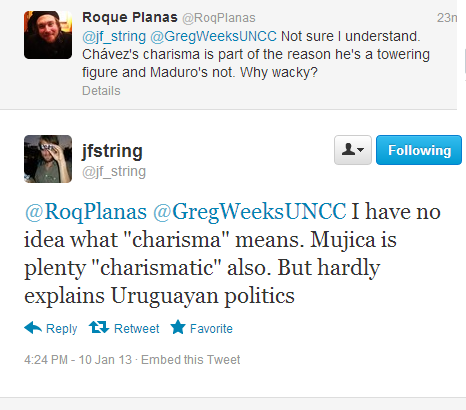 It centered on the punditry about Venezuela, and excessive use of "charisma" as an explanatory variable. The question about "charisma" is interesting. Hugo Chávez is clearly charismatic, but in and of itself that doesn't tell us anything. How do we measure charisma? It gets tossed around all the time to explain half of what Chávez does, and what his successors can't do (and I am plenty guilty of this). The same was true with countless debates about Fidel and Raúl Castro. From a social science perspective, however, this gets tricky. There are lots of current Latin American presidents who could be deemed charismatic, but how do we measure that? Is Chávez a 10 on a scale of 10, while Rafael Correa is a 7? How do we determine that, and what does it tell us about what they can or cannot accomplish politically? The prevailing hypothesis is that the more charisma you have, the more unified you can keep your political movement. Fair enough, but it actually tell us almost nothing even if we can define the term. Charisma is not the only factor involved, so we don't know how much charisma itself matters. Further, it tells us nothing about degree. How much more unified do you become with x charisma? So, I have lots of questions but not so many answers. It is fine to argue that Hugo Chavez is more charismatic than Nicolas Maduro, and therefore Maduro will have a more difficult time holding the diverse coalition together, as long as we recognize that this is imprecise and tells us very little about specific political outcomes. De esta manera, a pesar de que el 10 de enero se inicia un nuevo periodo constitucional, la falta de juramentación en tal fecha no supone la pérdida de la condición del Presidente Hugo Rafael Chávez Frías, ni como Presidente en funciones, ni como candidato reelecto, en virtud de existir continuidad en el ejercicio del cargo. What a mess. But the conclusion is that Chávez can be sworn in any time he likes in agreement with the Supreme Court. And since he packed the court, he'll decide. MS. NULAND: We have over the course of the last week or so talked in general about the succession situation in Venezuela. Let me reiterate our foundational point, which is that this is an issue for Venezuelans to decide, and it – they need to do it in a manner that includes all the voices in the discussion. So it needs to be a broad-based discussion and it needs to be decided in a manner that is free, fair, transparent, is seen as ensuring a level political playing field in Venezuela. At least it's a non-interventionist response. What I immediately thought, however, is that we're calling on all Venezuelans to resolve the issue of who becomes president. But the United States did not do the same in 2000. We let nine people decide for everyone. So do as we say, not as we do. But the fact of the matter is that representative democracies by definition don't let all voices participate and it does not guarantee a "level playing field." They allow the voices of those who were elected do so, mediated by other institutions like the Supreme Court. At this point, Venezuela is actually copying the United States since the Supreme Court has ruled Hugo Chávez does not need to be sworn in on January 10. First, if you argue about invoking article 233 (which refers to calling new elections), you will be accused of fomenting a coup. Second, if you argue about anything, you will accused of fomenting a coup. Paraguay is mentioned, although in that case everyone at least knew where the president was and that he had the capacity to make decisions. Third, mentioning article 233 means you are trying to invalidate the October presidential election. It is important to note, however, that in October Venezuelans voted for someone billed as recovering and quite clearly not dead or indefinitely unconscious. Fourth, if you demand that Chávez come to Venezuela on January 10th, then you are ignoring his doctor's orders. The fact that Venezuelans do not know who these doctors are beyond the fact that they are Cuban is not mentioned. Now, some on the right deserve criticism about coups because in fact they supported one in 2002. Nonetheless, citizens in a democracy deserve to be told the condition of their elected president. A month's disappearance with no indication of return is an embarrassment. The Venezuelan government announced that Hugo Chávez will invoke article 231 of the constitution and swear in at some unspecified later date. The letter they cite is from Vice President Maduro, not from Chávez, which means he is physically and possibly mentally unable even to write. And what does Article 231 say? OK, so now we parse. It does not say you lose the presidency if you are not sworn in on January 10. It only says you need to do so in front of the Supreme Court. I would take that to mean on that same day, as I wrote before, but it does not specify that. In other words, it is a stretch about the spirit, but falls within the letter of the constitution, especially since he has legislative approval to be outside the country. When you're referring to a president, though, spirit matters. What Venezuelans are being told is that their president is so incapacitated that he cannot be seen and cannot write, but that they should just trust spokespeople who have been lying constantly (while demonizing those who spread rumors because the government provides no facts!). Even if you admire Chávez, this should trouble you because it is no way to govern. It is almost exactly one month since the president has communicated directly with his country. Is there precedent for that? If so, my guess is the comparison will not be complimentary. So it's not unconstitutional. Yet. But we don't need constitutional articles to tell us that presidents need to show evidence they can continue governing. Hiding in Cuba and lying to your nation is really the definition of the opposite. We should not be surprised that the U.S. government spends more on immigration enforcement than all other law enforcement combined, and that the Obama administration has beefed it up like no other president. As I've written about many times before, Obama's strategy is to prove that he is focusing sufficiently on enforcement to convince restrictionists that they should support immigration reform. As I've also written, he will never achieve that. It's an enormous waste of resources. The biggest factor to explain the possibility of immigration reform is electoral. More specifically, does the Republican Party start twisting the arms of its own legislators in order to avoid permanently alienating a large majority of Latino voters, which would be an electoral disaster? $18 billion. Anyone who wants to trim government needs to take a very close look. Last June I mentioned how the State Department's Office of the Historian was publishing Foreign Relations of the United States as e-books. They just updated the collection and have a lot more on Latin America (in addition to many other countries) so you should go check it out. It's very cool to simply download them onto an iPad or other device. If you're into this sort of thing, you should also follow @HistoryatState on Twitter for updates. Kathleen Parker says the GOP needs to learn Spanish. I really like this. Exactly. It's not about reluctantly passing immigration reform, or trying to distance yourself from the overtly racist wing of the party in order to win Latino votes. It's about understanding and, gulp, even liking people of Latin American descent. Learning Spanish is the ideal way to do so. So to all you young Republicans in college, major or double major in Spanish. Everyone will be better off as a result. Theory creating and hypothesis testing are both important elements of social science. Unfortunately, in recent years the balance between theory creation/refinement and the testing of empirical hypotheses has shifted sharply toward the latter. This trend is unfortunate, because insufficient attention to theory can lead to misspecified models and overreliance on misleading measures of key concepts. In addition, the poor quality of much of the data in IR makes it less likely that these efforts will produce useful cumulative knowledge. The shift away from theory and towards hypothesis testing is due mostly to the professionalization of academia, and this trend is likely to continue unless there is a collective decision to alter prevailing academic incentives. The argument is that the subdiscipline of IR has been moving in a direction where the way to get a job and get tenure is to crank out articles with highly specific hypothesis testing that does not advance theoretical development. The classics of the field are more theoretical, but they argue that theorizing is being derided. My stance tends to be that aiming for middle-range theory is a good strategy. Walt and Mearsheimer basically agree, but say that hypothesis testing doesn't even do that, and I disagree. To be fair, I am a comparativist so read less IR literature. But take the democratic peace literature, which involves both theory and hypothesis testing. Sure, there may be a ton of articles simply tweaking data in a way that doesn't really advance the debate, or case study analyses that don't offer generalizable conclusions. But I would say the debate as a whole has been both intellectually stimulating and useful to policy makers to boot. In comparative politics, the same could be for the study of democratization. There is no overarching theory, but there is a lot of middle range theorizing. This has included a lot of hypothesis-testing and case studies that were very narrow--I often study the Chilean case, so could possibly be accused of that, in fact. But when the Arab Spring started, where did people--including policy makers and the media--start looking for clues? The experience of Latin America, which had yielded a lot of interesting insights. My takeaway is that as scholars we need to explain why our particular study is useful in some broader context. That need not be grand theory, but if a subject is narrow, then you should make an effort to explain why it's useful to be studied in the first place. It is true that pumping out articles is what assistant professors are taught to do. Hit a decent journal and the substance of your article may not even matter so much. So I would see this as a call also to journal editors and reviewers. Beyond the methodological sophistication or the incredible details of the case study, does the argument matter in a broader sense to middle range theory? QUESTION: Bolivia. New reports suggest that Bolivia’s efforts to fight drug trafficking without the assistance of the DEA or other U.S. authorities may be having some bit of an impact, although it is considered controversial. Has the U.S. seen these reports? And what does the U.S. think about the efforts to deal with illegal drug trafficking, coca growing in distribution, outside of a Merida-type relationship? QUESTION: -- in stopping the trafficking, particularly of coca and its byproducts. MS. NULAND: Let me get you a fuller report on this. You know that we’ve had longstanding concerns about the narcotics situation in Bolivia. That said, I think we do agree that they have made some progress in 2010, 2011, but there is a whole lot more to do. But let me get you a more subtle sense of that directly later today. QUESTION: Is it a sense of how much they’ve been able to reduce the trafficking? Is it a question of whether they’ve been able to crack down on illegal traffickers? What is the source of the U.S.’s concern here? MS. NULAND: Well, that the overall picture is still very high on a global scale. Bolivia does not have the DEA, but it has Brazil, in a plan that even includes drones. And the "overall picture is still very high on a global scale" even in countries the U.S. is sending aid to. But I guess the State Department is not getting the "vector," whatever that means. I wonder if a more specific answer really will be forthcoming. The Obama administration has used executive power to modify another immigration rule, the dreaded 10 year bar. The latest policy change is focused on illegal immigrants who have a spouse, parent or child with U.S. citizenship. Currently, in order to become legal they must leave the United States and apply for a waiver forgiving their unlawful presence in the country. Only then can they apply for an immigrant visa. And if they don’t get a waiver, they are barred from returning to the United States for up to 10 years, depending on the case. The specter of being barred deterred many from applying. But under the rule change finalized Wednesday, those who qualify will be able to apply for waivers from within the United States starting March 4. Applicants must return to their native country for a brief period for the consular immigrant visa process. This is an important step. The fear of being barred has paralyzed a lot of people, who in general fear inadvertently doing anything wrong. If you leave, you might not come back. Your kids are U.S. citizens and have grown up in the U.S., so chances are they're not going to return with you. Economically, you are then also hit with splitting your incomes. It's a disaster for families. First, aggressive enforcement did not hurt Obama in the election. Offering periodic executive reforms were enough to keep Latinos in his corner. He knows that. Second, he may need a reservoir of goodwill because other issues like the debt ceiling and gun control are crowding forward and will receive attention first. In his first term, health care wiped out any chance at immigration reform. Today I received a hard copy of the American Political Science Association's Political Science in the 21st Century Task Force Report. I read through it, and its discussion of how to make political science research relevant is not very good. My discontent stems from the fact that it totally ignores social media, which currently is the most important source of connection between political science and the wider world. In fact, I did a search and found no mention of the word "internet." The report therefore has an old fashioned flavor, seemingly unaware of the important trends of the 21st century. Thinking of such trends, I have opted out of receiving APSA journals in hard copy, yet I receive this report dated October 2011 in January 2013. There is in fact a PDF available online, so I chucked the hardcopy straight into the recycling bin (or maybe they are just late in sending it to me, and I am whining long after everyone else already did). There is no mention of blogs, Twitter, Facebook, or other media. Instead, we get reference to a single New York Times article from 2009 where a reporter complains about political science. Therefore the report was badly outdated long before its publication. The Monkey Cage blog began in November 2007 and so was there for everyone to see before this report was completed. Apparently the authors knew nothing about it, or the many blogs on a wide variety of topics written by professors that engage the mainstream media and others who have traditionally been skeptical of the discipline. Dan Drezner had a good post on this topic in November. I don't want to be harsh, but I do want the political science establishment to budge a little bit more. There are a lot of cool things going on in the 21st century and APSA should be cognizant of that. If snap presidential elections are held in the coming weeks, they will not necessarily favor the democratic opposition, especially if the Chavistas preserve their unity. While the likely opposition candidate Henrique Capriles, governor of Miranda, appears more popular than either Maduro or Cabello, his ability to deliver an electoral victory is still in doubt. An emotional hangover following Chavez’s death, promises to continue in the fallen leader’s footsteps, and an unfair electoral process might easily give a decisive edge to Chavez’s successor. This logic sounds suspiciously like Mitt Romney's. Hilariously, the "unfair electoral process" quote linked to Ray Walser, who predicted Chávez would steal the presidential election. Winning elections and governing are two different things. In the Venezuelan case, they get conflated. A minority of Venezuelans strongly dislike the way Chávez governs. But as long as the opposition itself believes in the elections, then it is not accurate to call them undemocratic just because the outcome does not go your way. Matthew M. Singer, "Economic Voting in an Era of Non-Crisis: The Changing Electoral Agenda in Latin America, 1982-2010." Comparative Politics 45, 2 (January 2013): 169-185. Latin America's political economy has shifted in the three decades since the return to democratization, with the inflationary crises of the 1980s fading into the past. One consequence of this change is a reduction in the electoral salience of inflation. While electoral support for the incumbent in the 1980s and 1990s was strongly tied to his or her ability to prevent increases in prices, in the 2000-2010 period there was no significant association between inflation rates and election outcomes. Instead, incumbents who presided over a growing economy in the last decade reaped electoral benefits. The importance of the economy for electoral outcomes varies over time and even across economic indicators. Basically, once inflation was tamed then voters began to care less about it. Moreover, they were willing to suffer relatively high rates of inflation (relative to history, that is) as long as they felt the government was promoting growth sufficiently (e.g. countries like Argentina and Venezuela). Another angle to take is political learning to help explain why inflation is much less of a problem than in the past. Presidents have seen how badly their predecessors were punished for inflation, and therefore take greater strides to prevent it. It's not clear where the "inflation punishment threshold" is. In other words, at point is growth not enough because voters see their purchasing power diminishing too much? Juan Carlos Garzón Vergara has a post about how the marijuana legalization discussion plays out in the U.S. and in Latin America. In particular, he notes that Latin American political leaders along with the general public view legalization with some concern. This is true, but I think his last paragraph actually points to the much more important dynamic going on. However, this situation should not obscure the significant progress made in the public discussion regarding the hemisphere’s failed war on drugs, and the need to adopt a different strategy. On the contrary, it is necessary to intensify the debate within the countries and have a clear regional position about a likely legalization of marijuana in the United States. Latin-American countries must decide whether changes are going to be the result of a regional consensus, or if it will be a unilateral decision from the United States – again. What this means is that for the first time there is actually dialogue rather than monologue. That's a major shift. Now, it doesn't necessarily mean the federal government will respond with reforms, but there is more recognition of the Latin American side than ever before. Nothing starts off a new year like profanity-laden insults. I read David Mamet's play Glengarry Glen Ross, which obviously also became a movie. It was a spontaneous pick-up from a recent trip to my local used bookstore. Anger, fear, and frustration pulsate from the dialogue. Everyone is constantly and publicly aware of their standing within the real estate office, with the board reminding them of their status. Status improvement essentially means the ability to sell plots of junky Florida land to unsuspecting people. Reading it might actually make you feel a little better about yourself.